Chocolate is overtaking coffee as the trend that is permeating all facets of society, as reported by Datamonitor, a research firm that finds chocolate to be in their list of top 10 trends. Even though the economic climate is soft, chocolate seems to be immune. Chocolate is accessible, economical and delicious – and it’s no wonder that this delectable treat continues to satisfy people. If you’re already in the food business or want to enter into the industry, chocolate fountain rentals are proven to be popular and lucrative sources of revenue. Why is Chocolate so Popular? Chocolate is an appreciated universal indulgence, but its popularity has skyrocketed in recent years for a medley of reasons, including health ones! Research studies consistently discover health benefits in food once thought to be a sinful indulgence, like red wine. Dark chocolate was also added to the list of “healthy” foods after flavanoids found in dark chocolate were determined to have health benefits. According to Mintel International, this study increased the sale of dark chocolate in 2006 alone by 40 percent! Chocolate made from natural ingredients is also a draw for consumers, as it reduces health risks found from eating food with hydrogenated oils. 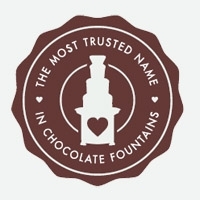 How Does Sephra Chocolate Fountains Create a Business Opportunity? Chocolate fountains are a timeless way to jump on the chocolate bandwagon. Special events and parties create atmospheres where people want to enjoy good food, nice presentation, and indulge in some chocolate. A chocolate fountain entertains and satisfies chocolate-craving guests while creating an eye-catching display. Chocolate fountain rentals can not only increase revenue for businesses, but could increase business through word of mouth accolades. Having a chocolate fountain present at a party with 150 guests is the best way to advertise its benefits. Guests get to use the fountain, taste the chocolate, and they will most likely ask for your business information so a chocolate fountain rental can be arranged for their next event. Sephra’s chocolate fountains make a striking yet sophisticated statement and pay for themselves after a few rentals. Commercial chocolate fountains are perfect accents for weddings, corporate events, birthdays, anniversaries, or any catered event where a client wants to offer guests a special treat other than pieces of cake for dessert. Now is a great time to begin a chocolate fountain rental business, especially if you already have contacts with caterers and party venues who would take advantage of your services. Sephra chocolate fountains offers a variety of sizes to help get you started and has the advantage of producing the only gourmet chocolate ready to use in its fountains without adding vegetable oil. Even better, Sephra’s chocolate for chocolate fountains are made with natural ingredients, so clients can enjoy chocolate without guilt. All this translates into a delicious, recession-proof trend!